Facebook Ads - Are They For You? Facebook is like the social media elephant in the living room: it's too big to ignore. According to Social Media Examiner's latest report, a commanding 93% of social marketers regularly use Facebook ads. Despite this, marketers are often unsure if their Facebook efforts are effective or not. When considering how to spend their precious advertising dollars, many businesses are still asking if Facebook ads are a good fit. Here are a few questions and common objections that will help you decide if you should be doing Facebook ads. Are your customers on Facebook? This is an objection we hear mostly from B2B businesses. "Facebook is great for B2C," they say, "but my customers just aren't on Facebook." Is that really true? As of Q1 2017, there are 1.9 billion monthly active users on Facebook. Think about that for a minute. There are only about 3.7 billion Internet users worldwide, which means more than half of them are on Facebook. This number dwarfs the user count for any other social media platform. 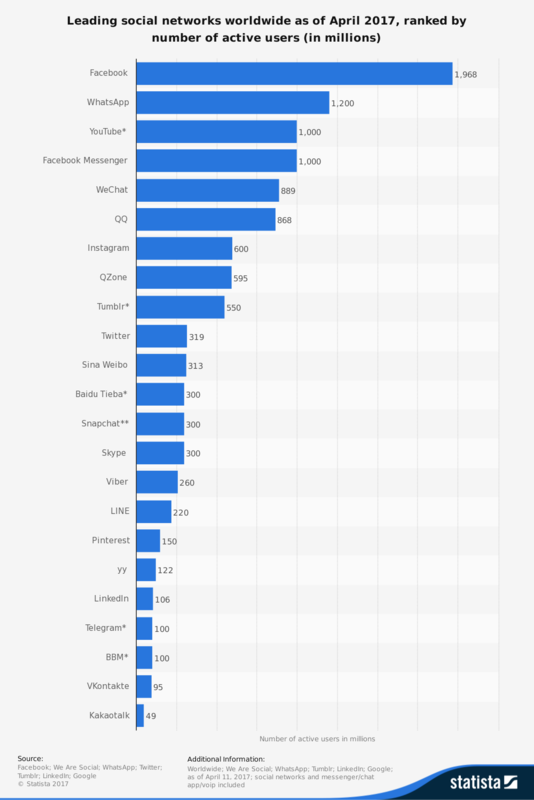 As you can see from the chart below, some of the closest competitors include WhatsApp and Facebook Messenger, both Facebook products. Not only is Facebook's audience huge, it's also highly active. The company reported that users spend an average of 50 minutes per day on their apps (Facebook, Messenger and Instagram). When you think about people's fragmented attention spans, that's an enormous amount of time. In fact, Facebook accounts for one in every six minutes spent online. With an audience that big and that active, it's hard to believe that your customers just aren't on the platform. Statistically speaking, unless you have an unusually niche audience who hates the Internet, your audience is probably on Facebook. Can you reach your specific audience? The great thing about Facebook is its astounding 1.9 billion users. The problem is that 1.9 billion is a pretty big haystack when your audience is a much smaller pile of needles. Thankfully, Facebook has highly advanced targeting capabilities so you can really hone in on your precise target audience. Through partnerships with big data companies, Facebook provides sophisticated targeting that goes well beyond standard demographic and geographic criteria. You can reach audiences based on life events like getting married, having a baby or getting a new job. You can also target based on people's behaviors, like buying a new car, travelling frequently or donating to charitable causes. Even better, Facebook allows you to create Custom Audiences based on people who have visited your website, or email and phone lists that you already have in your database. Layer in demographics like age, job function or geographic location to get hyper-focused. You can also use Custom Audiences to send retargeted messages to people who already know you, which helps increase conversions. Lastly, Facebook can create Lookalike audiences that have similar traits to your custom audience, allowing you to reach more people just like your Custom Audience. 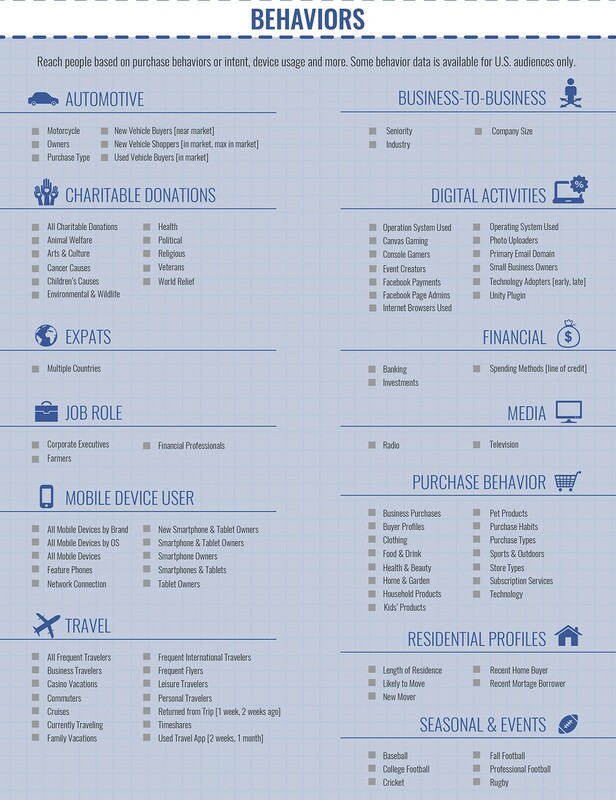 Remember, there are great options here for B2B too. You can target based on job title, employer, company size, industry and more. The behavioral filters also let you narrow by business purchasing behavior, such as people who have purchased business repair/maintenance services. Of course, Custom and Lookalike audiences are a powerful tool for B2B as well as B2C. Can you afford Facebook ads? Budget is always a factor as businesses debate how to best spend their advertising dollars. 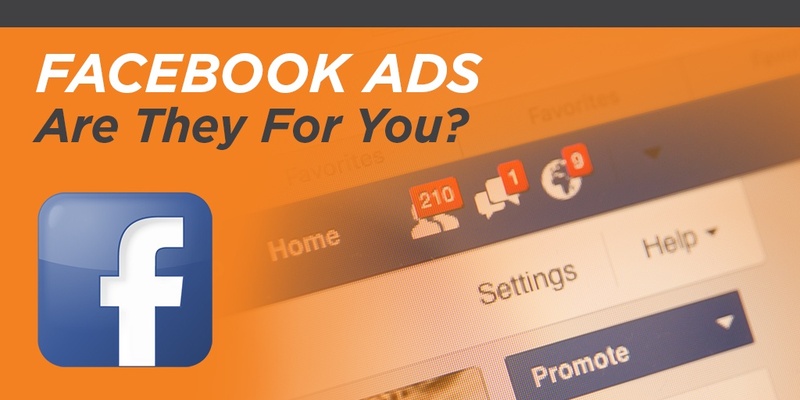 Facebook ads are a popular choice in part because they are so affordable. The average cost per click (CPC) for Facebook ads in the U.S. is about $0.28. This is significantly lower than the average CPC for Google search or display ads, which are $2.32 or $0.58, respectively. Compared to other advertising methods, Facebook provides an immense opportunity at an extremely affordable price. 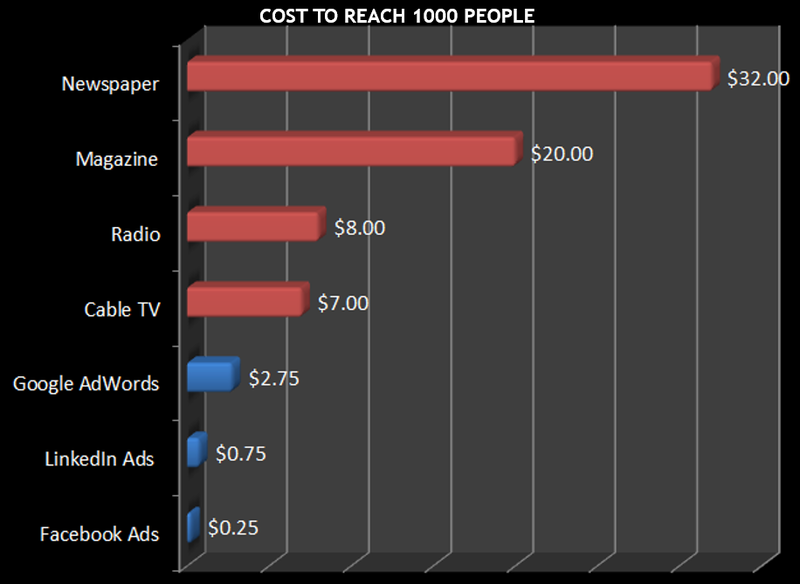 In fact, the minimum ad spend on Facebook is just $1 per day. A recent blog article from Moz makes the case for Facebook ads, showing how just $1 can get your business in front of 4,000 people per day. Of course, many businesses will want to invest more than $1 per day in order to drive more significant results. Regardless, as the author says, "If you can't spare $30 a month, you shouldn't be in business." If you already have a great Facebook business page with tons of followers and engaging posts, maybe you're thinking you don't need Facebook ads. Or, perhaps you're investing in other social channels and don't want to add Facebook into the mix. Think again. 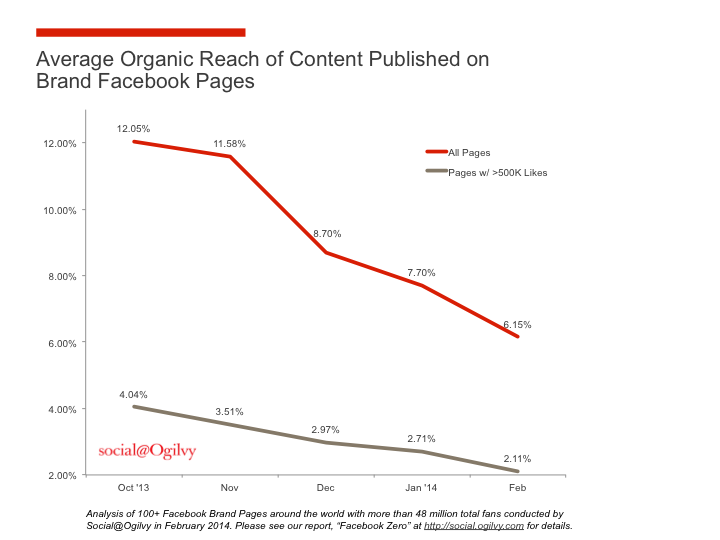 Facebook has become notoriously "pay to play," with organic reach plummeting to as low as 2% and continuing to drop. Businesses can no longer count on only regular posts on their business pages to reach their audience. Like it or not, paid promotion is now a necessity to drive results on Facebook. If you don't like "pay to play," why not avoid Facebook entirely? The problem is that Facebook is the gateway to the ever-growing mobile audience. Facebook boasts 1.5 billion mobile users, of whom almost 900,000 log in exclusively via mobile. This gives Facebook one of the largest mobile-exclusive audiences in the world. So if your customers are browsing on mobile, you should definitely be considering Facebook ads. This is the ongoing debate. Despite the number of businesses who use Facebook ads, many don't feel like their ads are working. There are a variety of reasons for this. Remember that Facebook is a social network, and advertising there is fundamentally different than AdWords. People aren't on Facebook to buy your products or download your new e-book. They're there to see photos from friends, to keep up with news, to share what's important to them. Bottom line: they're not necessarily in a buying mood. So what does that mean for you? First, make sure your approach is focused on promoting content that is truly compelling, entertaining, or shareable, not just pushing your sales message. Your message needs to be highly compelling and highly clickable to compete with funny cat videos. Second, make sure your goals are realistic. If you have an e-commerce business, direct sales ads may work for you. For many others, Facebook is more effective for uses like brand awareness, engagement or lead generation. Lastly, many Facebook ads fail because they are not properly targeted. Facebook has such immensely powerful targeting capabilities, they're almost creepy. (If you don't believe me, check out this example of a guy who used Facebook ads to prank his roommate). Make sure you're taking advantage of these powerful tools. Implemented correctly, Facebook ads can be extremely successful and highly cost effective. Facebook has a ton of case studies to prove it. Wrap up: should you advertise on Facebook? Simple answer: probably. Even if Facebook isn't a core part of your business strategy, it offers enormous potential benefits with an extremely low cost of entry. Of course, there are always variables an exceptions to the rule, but overall if you can spend a couple dollars a day to leverage an audience of billions to get in front of your precise targeted audience, why wouldn't you? Need help getting started? We'd be happy to sit down with you for a free no-risk, no-obligation Facebook review.